Behold, how good and how pleasant it is for brethren to dwell together in unity. It is like the precious ointment upon the head; that ran down upon the beard, even Aaron's beard: that went down to the skirts of his garments. Psalm 133:1-2. 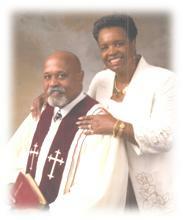 It has been our pleasure and honor to serve as Pastor and First Lady at Mt. Bethel for approximately 15 years. It has been very challenging, yet rewarding. We thank God for his awesome opportunity. We have been married for almost 42 years. We are the proud parents of two sons, Brian, who resides in Colonial Heights, VA; and Travis, who resides in Richmond, VA. We have one grandson, Brian, Jr. 10 years old. We both graduated from Luther H. Foster High School in 1967. Pastor Hobbs went on to Miami, FL to pursue his degree from Miami Dade College. I attended North Carolina A. & T. State University in Greensboro, NC. Pastor Hobbs received his Masters of Divinity from Virginia Union University. I received my Masters in Vocational Special Needs from Virginia Tech. We retired in June and November 2003, respectively. Pastor Hobbs retired as supervisor of transportation from Norfolk Southern Railway after almost 35 years of service. I taught and retired from Nottoway High School after teaching for over 31 years. God blessed us to retire in fairly good health and we have been able to travel, enjoy family and friends, and still serve this church family to the best of our ability. As we look back over the years, we can truly say God is good and He is good all the time. We thank Him and this church family for giving us this opportunity to grow in wisdom and knowledge as we have watch each of you grow spiritually over the past 15 years. It is our hope and prayer that God will continue to bless each of you in spirit and in truth; and that He opens windows and pours out blessings you will not even have room to receive. Our prayer is that God will richly bless each of you with peace of heart and mind.